The benefits to family life of exercising together come in many different forms. The one thing which can be said, without a doubt, is that exercising together, as a family, will increase your quality of life, both as individual members of your family but also as a family unit. The reasons for this are outlined below. 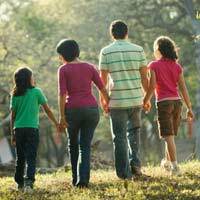 The first way in which family life is benefitted by exercising and getting fit together is simply that it enables the whole family to spend some quality time together. In today’s busy world, it often happens that each individual member of the family is busy with their own activities or work for most of the day. Thus, when the family does come together as a unit, people can be tired and worn out, resulting in poor quality of time together. But if you have a shared goal, whether it be a long walk after Sunday dinner or a family bike ride into the hills, you will enjoy the leisure time which you spend together much more. Again, the way modern society and modern life works means that there may not be many shared interests between family members, leaving them with little to chat about that they are all interested in. It may be that dad likes to cook but mum is more interested in current affairs, while the youngsters prefer to talk about their favourite bands or their individual sporting efforts. Consequently, families can end up spending less time together because of a lack of shared interests. But taking up a sport together, or even just exercising together, gives the whole family something in common. For this reason, it is important to make sure that the exercise you choose is something everyone will enjoy equally, otherwise the person who enjoys it least may end up resenting the rest of the family. By exercising as a family and training together, you will be able to motivate each other on to your goals in a much better way. As you all know how hard the goals are to achieve, there will be much more of a shared sense of satisfaction when each individual member of the family reaches their goals – whether it is taking the stabilisers off a bike or running 5km without stopping. As there will be plenty of motivation from fellow family members, everyone will be more likely to push themselves to the limit and keep up the exercising regime. Exercise and sport are great levellers because there is something for everyone, regardless of ability. This translates particularly well into a family situation because it means all family members are able to take part in something and feel a part of something – while achieving real goals towards fitness at the same time. The benefits to family like really are manifold and numerous and no family should discount them and exercise, as a way of improving their lives, getting fit, and becoming a closer family as a result.